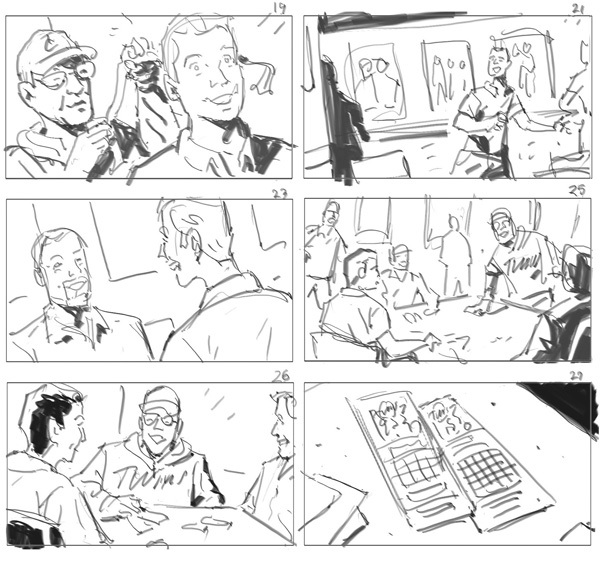 Last month, I drew up some shooting boards for Unbelieveable, a commercial for Minnesota State Lottery featuring some former Minnesota Twins players and ex-head coach, Tom Kelly. I met with the director (who'd flown in from California) Monday morning, drew the frames Tuesday in 4-5 hours, and they had a crew at Target Field by Thursday to shoot the spot. It was released March 12, only five weeks after I first snagged the job. Based on a quick discussion with the director, I dashed out 27 frames to serve as a guide on set. Take a look at a sampling (below) of 2/3 of the group - some of the scenes did not make the final cut, most likely due to editing. I always find it interesting to compare my rough frames to the finished spot. Though I would've loved to have more time to flesh these out, this was a quick, fun job! Maybe you've seen the new 3DTV Best Buy commercial? Here are a couple storyboard concept drawings I did for it: I was provided reference for the actor playing the blueshirt. He's all over the Best Buy site, too, in vids for laptop test drives, etc. The character types, staging & blocking and more change as it gets closer to actually shooting the commercial. Sometimes the concept drawings I do look exactly like the final commercial, other times they bear only a passing resemblance. These frames were done digitally, completely in Photoshop. For this frame from a Fiber Choice storyboard, we were asked to fill the screen with fiber-iffic fruits and veggies. This was patched together digitally from a series of other drawings, so we could save time using elements I'd already drawn, just rotating some to mix 'em up a bit. And these two were of a series prepared for a Fiber Choice running on TV currently. Veggie and fruit eyes and mouths were moved and rotated digitally to form various expressions. Why redraw? For this last grey tone "bite 'n' smile" shot, we threw a spot color on the tablet to help draw attention to the product. Following those storyboard pencils I posted yesterday, here are some color frames recently finished. As I've mentioned previously on this blog, I keep them looser by coloring over scanned pencils, then coloring digitally on-screen with my trusty Cintiq. The rough color effects are achieved simply with a "chalk" brush in Photoshop, at various degrees of opacity. People with products. Go figure, I enjoy drawing them, after all these years. 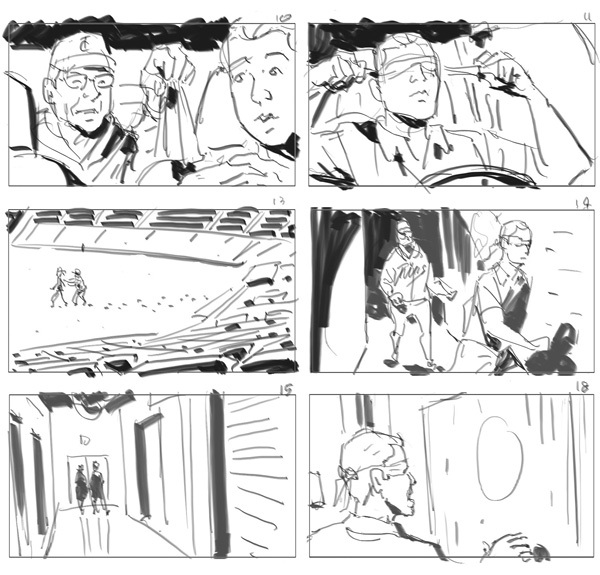 From a recent storyboard job, these are a couple of my favorites. Every so often, the client just wants penciled frames, and I need to do them even quicker than usual, down and dirty. Penciled frames like these don't take too long, maybe 10-30 minutes each, depending on the content and level of detail. Once I have a shot roughed in, I sometimes take reference photos to get a quick idea of a particular gesture, and other times I jump right in and draw without a guide or net. The best boards, I think keep things loose, while still readable and "all there." For this job, I did over thirty frames in just over a day. I'm coloring my storyboards digitally now, with my trusty Cintiq. Still penciling at the drawing board, I scan the pencils, darken them in Photoshop, and color away. I'm finding with the Airbrush Pen Opacity Flow brush at certain settings, I'm able to achieve a similar look to those frames colored with markers. To rough things up a bit, and to lessen any computer sterility, I use a large chalk brush to finish things off. The more I do, the quicker it gets! 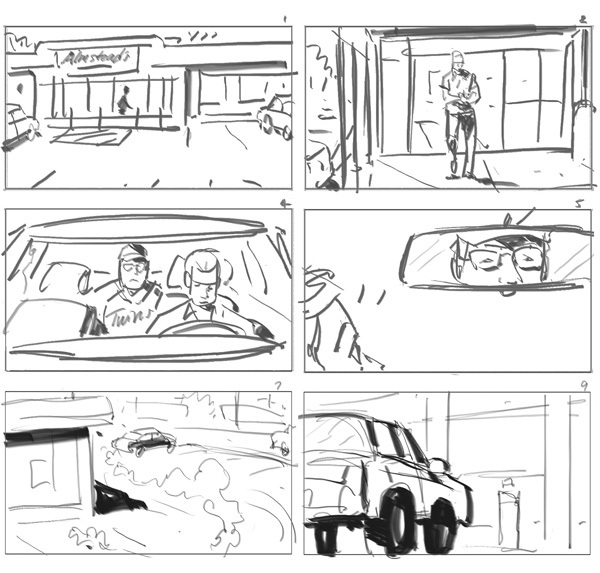 About half (and in the past, sometimes more) of what I do is storyboard work for television commercials. Storyboard frames are quickly executed drawings to communicate a concept, and help test and plan television, movie or animated projects. I've been doing storyboards for over a decade, and find it helps me as a cartoonist, requiring me to think and work fast, and keep loose. For years, I'd color them with marker over inked drawings I'd copied on marker paper, achieving a more cartoony and clean look, but which also created an extra step and took time. The last five years, I've skipped the inking step altogether. With these two examples above, I colored with marker over printed pencils on marker paper. I beef up some lines and spot black areas with a thick marker, and rough up and add texture with a black colored pencil. Some storyboard artists do more polished and finished frames that look nearly like finished illustration. I prefer a looser, rougher look and feel, and so work with Art Directors with a similar sensibility. The last few months, I've been coloring my penciled storyboard drawings on the computer with the Cintiq, and will share a frame or two of those tomorrow.